I must admit that lately I have become a bit lazy in the kitchen. Laziness. Yes, is there any problem with that?, what happens is that my passion and my profession also have their ups and downs. I can fool myself saying that the terrible heat we are suffering is the responsible for that but not, why should I lie to myself? The demotivation sometimes grabs you. I usually let myself flow and that soothes my natural ability to have everything under control and very well organized. That relief is pleasant until you allow yourself to go too far and then, coming back to the middle point seems to be something really problematic. And it is then, when a challenge comes up that you end up coming out of that “you are letting yourself go way too much”. It has happened to me twice this week and I am really grateful to the people that have faith in me, and that have rescued me so many times (even though they themselves might be thinking that are annoying me). When an amateur cyclist has his energy bars without any doubtful ingredients and they are so good that don´t crumble or melt while climbing on the bicycle, and when he eats them during the climb and gets a ton of energy, that is…wowww…an amazing feeling. When a mom confesses to me that she is very worried because she doesn´t know how to include more fiber in her son´s diet (because he is a very fussy eater), and I end up making a granola bar for breakfast low in sugar (with just a bit of maple syrup) and packed with fiber and good things and the kid just loves it…ayyyy…I become so proud of myself! I always say that these sorts of little things are my daily gifts. Today´s recipe is one of those challenges that force us to go ahead. Last summer I was looking for a drink different from the “horchata” (tiger nut milk drink) or almonds milk that I usually make. Something with a lot of chocolate for those days that you desperately need a shot of magnesium, but at the same time nothing too heavy or with a lot of sugar. I thought about the taste of the “cacaolat”, and decided to get something similar but a lot more healthy…And that is how the hazelnut came around, an ingredient that I had never used before and that gets along very well with the chocolate. I advise you to try it like this, without the cocoa, because it is simply delicious. 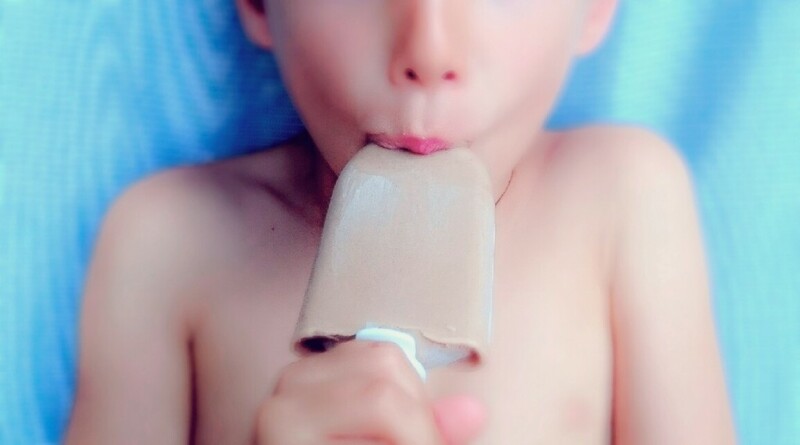 However, I must say that the vanilla didn´t appear on its own, because it is a basic ingredient in the chocolate world and in this case, gives sweetness and a recognizable aroma to the recipe. 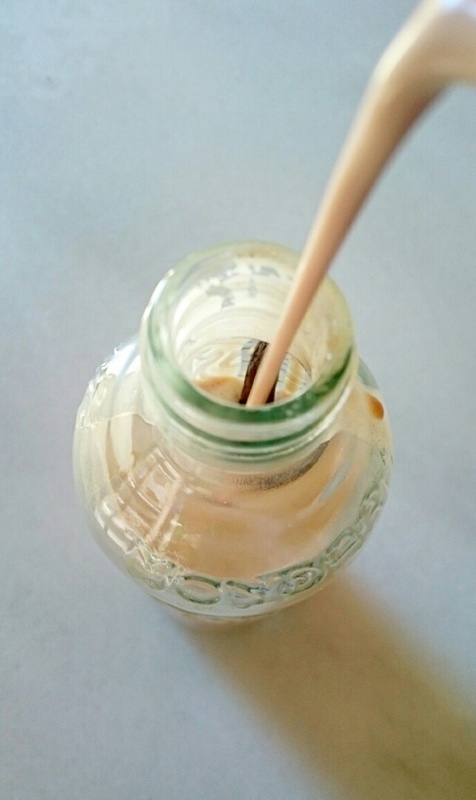 To get an amazing taste, when you are done and you put it inside the bottle, it is very important to remember that you also need to put the open vanilla pod inside the bottle to leave it infusion for at least 12 hours. I leave it inside until there is not milk left. 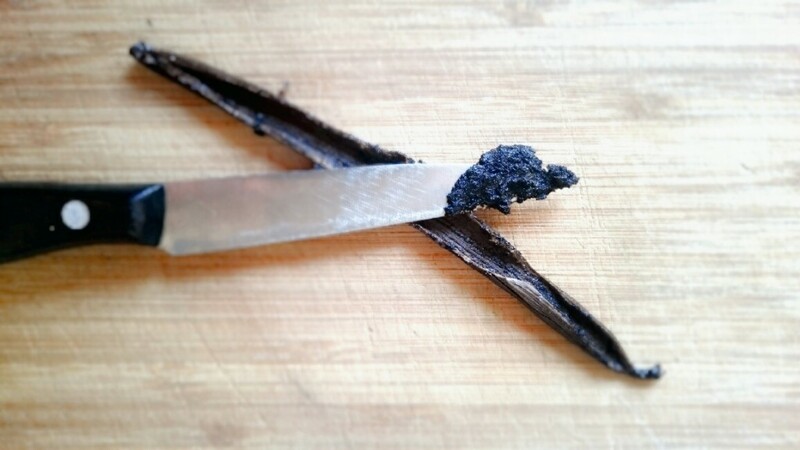 Afterwards I wash the vanilla pod with water, and leave it to dry. Most probably, I will end up putting it inside a vodka bottle where all my left vanilla pods are kept because after a few months I get a strong vanilla aroma that I use in pastry making. It is so expensive that it is a really good idea to make its aroma last for as long as you can! Whenever you buy it, check that it is flexible, it shouldn´t be hard or dry. And keep it in the fridge. It is important to drink it very cold and it is also essential to lie down while you savor it little by little to make the most of the moment. And I could finish here this recipe, but my always active mind never stops and is constantly looking for easy ways (a real challenge!) to use a recipe in different ways. The easiest one consists of pouring out the “cacaolat” in lolly moulds. It is a genuine resource for when the known by everyone childish sentence “I am hungryyyy” comes up. The second version, very easy as well, makes up a delicious and filling snack or even a complete breakfast if you are willing to add more fruit and granola on the top. You only have to mix the banana together with the “cacaolat”, pour them into a bowl, add the seeds and make sure to stir very well with a kitchen stick. After 10 minutes stir the mix again and let it stand in the fridge during one hour till it thickens. Distribute it within several small glasses and top it with whatever you like, for example red fruits, grated coconut, cocoa nibs o whatever comes to your mind! Remember that it is very important to have it cold. 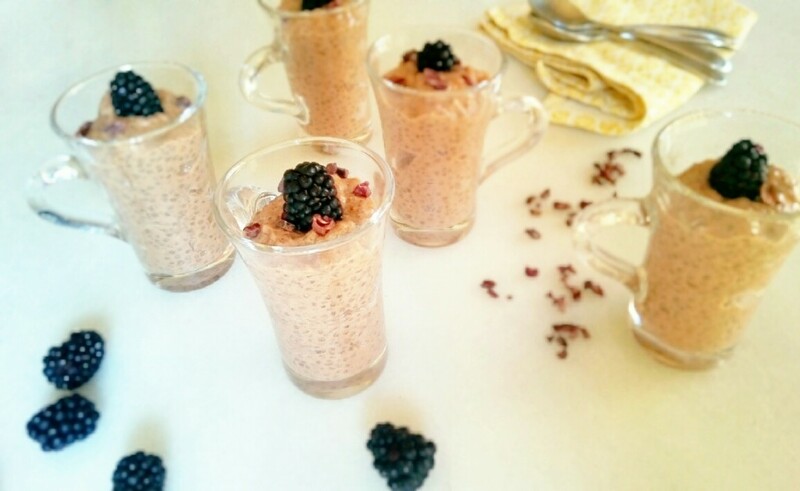 Now the only thing you have to do is to try the three different versions of a delicious, healthy and nutritious dessert. Let’s see which one you like more! Leave hazelnuts to soak during 12 hours. Crush them with half of the water and strain it with the help of a vegetable milk bag or gauze. 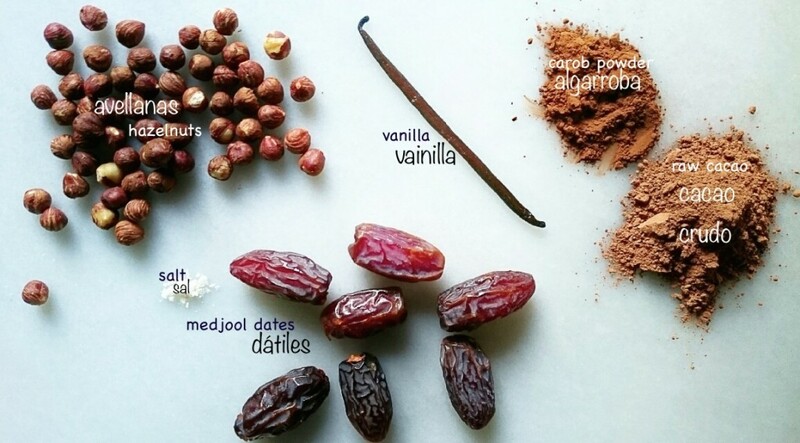 Grind the rest of the water with the dates, cocoa, carob bean, salt and the interior (seeds) of the vanilla pod. Add the strained milk and grind again during 20 seconds more. Pour it in a bottle where you will have previously put the open vanilla pod which was left over. Let it stand in the fridge during at least 6 hours in order for the pod to become an infusion. Remember to whisk it well before having it.